Twitter, the micro-blogging website has always been a platform for people to openly express their opinion and humorously roast anyone and everyone who manages to create horrendous gaffes whenever the opportunity arises. The mainstream media and the celebrity journalists have been very liberal in providing such opportunities. Yesterday the security forces killed Hizbul Mujahideen commander Sabzar Ahmad Bhat, who was the infamous successor of terrorist Burhan Wani. He was gunned down by security forces in South Kashmir’s Pulwama district. As the nation was busy congratulating the army for eliminating one more wanted terrorist some sections of the mainstream media decided to come up with peculiar headlines with regards to the slain terrorist. Earlier, after Burhan Wani was killed by the security forces, controversial journalist Barkha Dutt had introduced him as ‘son of poor headmaster’. 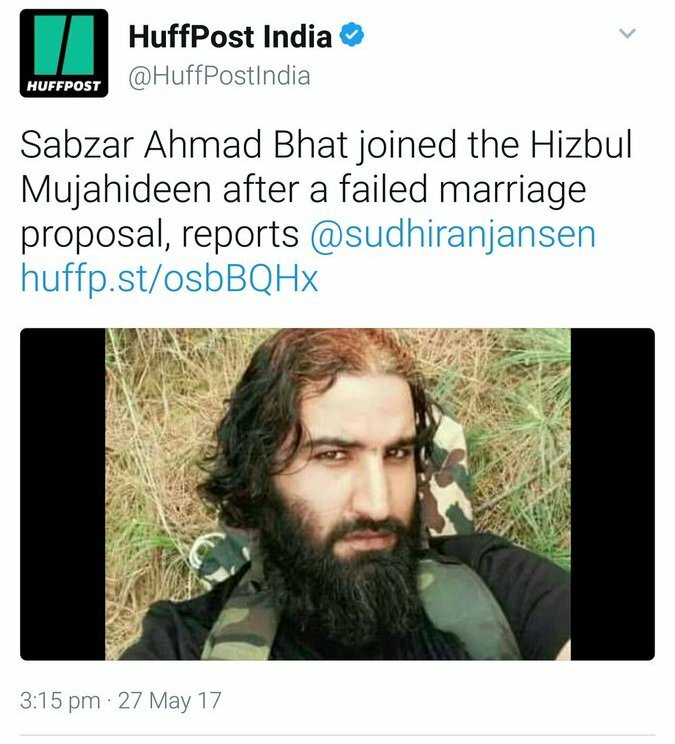 HuffPost and Times of India, possibly inspired by it, decided to introduce the soft side of the terrorist we did not know. 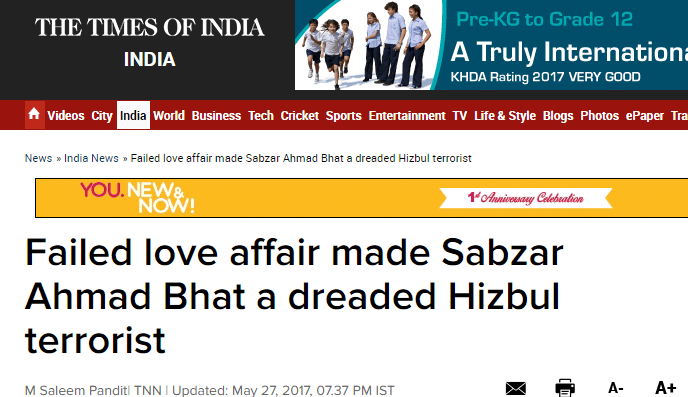 Both these articles  portrayed that Sabzar had decided to become a terrorist after a girl he loved had decided to spurn his marriage proposal. The headlines might give out the feeling that Sabzar was just another boy next door who was just a normal guy, until the time the girl rejected him after which his head suddenly turned. But as reported by TOI itself, Sabzar was always a crook and a drug addict who had dropped out of school after failing his Class X exams, who then decided to indulge in criminal activities like drug peddling, thefts, robberies and kidnappings. Marriage was just one of the things he tried and failed. People on Twitter though were baffled by the very weak “failed love affair” excuse for becoming a terrorist, as the headlines suggested. #ITurnedTerrorist because my wife and my mom always fight for me. Sometimes I feel like Kashmir. @Ra_Bies #ITurnedTerrorist because she said “I like you but as a Freind” ?? #ITurnedTerrorist bcz I used to watch NDTV a lot. #ITurnedTerrorist because I saw few people sharing videos of Dhinchak Pooja on my facebook timeline!